Sheila Connolly and I have an unofficial cake baking challenge going on. It's unofficial because we didn't plan it. We just seem to be on the same wavelength. Okay, I admit that I coveted her Bundt cake last Friday. My little loaf cake disappeared in a snap. I needed to bake something that would last longer. And I needed something for a mini-roadtrip. Someone (not naming any names) has to eat every few hours, so we need something on hand to nibble on. Sticking with the Bundt cake concept, I baked an apple cake. There's a lot of sugar in it, but (maybe because it's big?) it's not overly sweet. It's just about right. 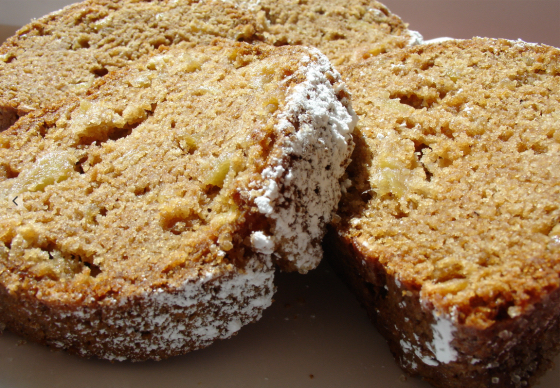 The chopped apples keep it nicely moist. I used both oil, which makes cake moister, and melted butter because butter adds a special flavor and crumb that oil just can't quite duplicate. You can change around the spices to suit yourself, of course. I dusted it with powdered sugar just before serving, but you could make a white lemon drizzle if you like that better. Part of this is really sort of a dump cake. A lot of ingredients go into the mixer together. The time-consuming part is really just peeling and chopping the apples and other prep work. Melt the butter and set aside to cool. 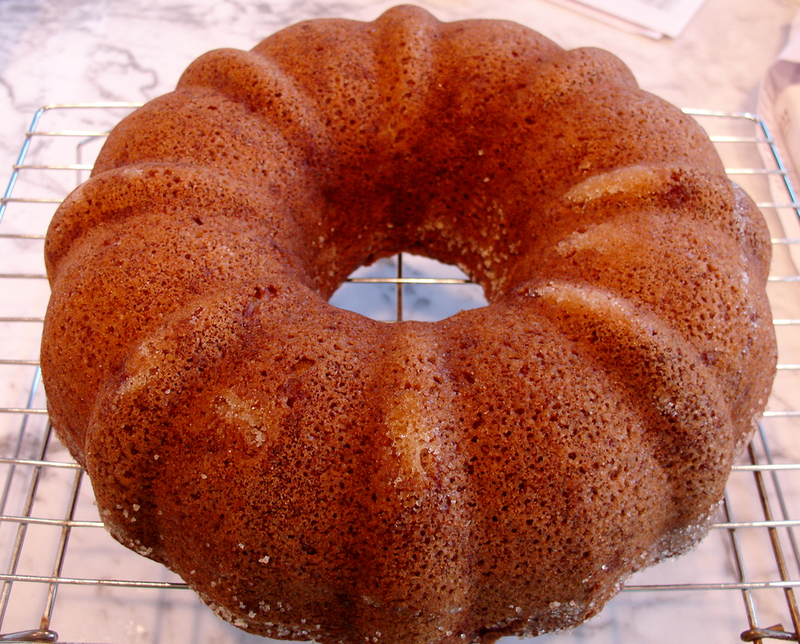 Grease a Bundt pan with the butter and use 2-3 tablespoons of sugar (instead of flour) to dust it. 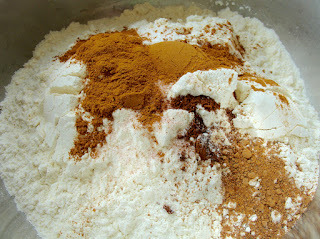 Combine the flour, baking powder, baking soda, cinnamon, nutmeg, and cloves in a bowl. Stir with a fork or a whisk to combine. Set aside. Peel and core the apples. Chop them into chunks and place them in a bowl. 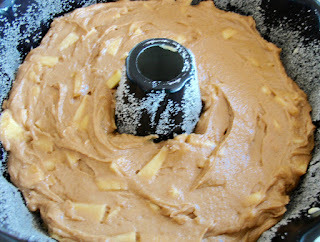 Sprinkle with 2-3 tablespoons of dark brown sugar and toss to combine. Add the lemon juice and toss again. Set aside. 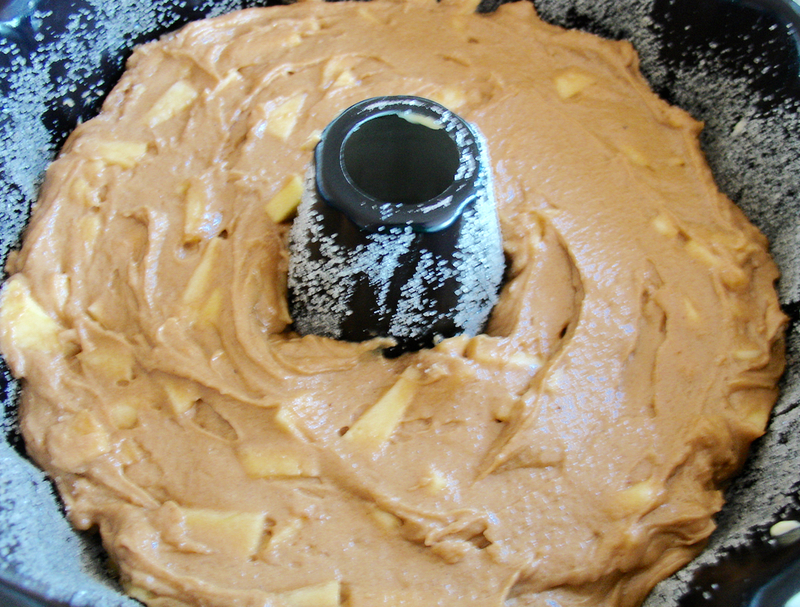 In a mixing bowl, combine the sugar, 1 cup dark brown sugar, three eggs, oil, and melted butter. Beat for 3 minutes on medium speed. On low speed, gradually add the flour mixture until it is just combined. It will seem a little too thick. Pour in the apples and mix on lowest speed (stir). Bake 1 hour or until a cake tester comes out clean. Allow to cool on a rack for 10 minutes before loosening the edges and flipping. 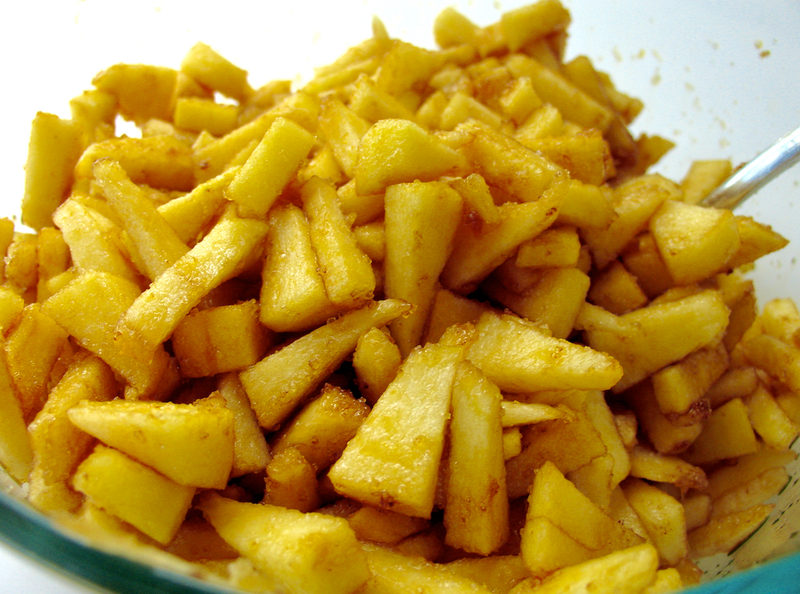 Chop apples and mix with brown sugar and lemon. Spoon into pan and smooth. Cake wars! (Don't worry--this week I'm using a fish recipe...but there's always next week.) You can't go wrong with apples. Have you tried a mechanical peeler? I've got one new one modeled on a traditional type (that peels, cores and slices all at once), and two flea-market vintage ones. Or is it three? Your cake looks lovely, any way you slice it. Sheila, I have never used a mechanical peeler but I'm interested in the one that does it all. Is there a brand name I could look up? Yum! I love anything with apples and cinnamon in it. There's something about that combination that's just so good! Yummy. This looks nice and fluffy too. Very moist. Tonya, between the apples and the oil, it's very moist. And it was perfect for our little road-trip. LOL! I can see us shipping cakes to MLK authors to sample! A culinary smackdown?! I'll buy a ticket! 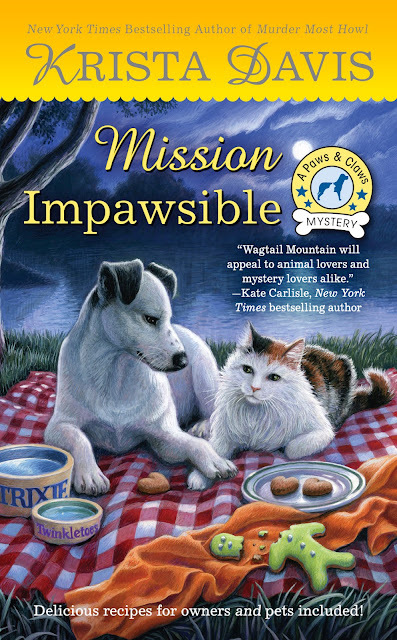 If I hadn't just had a piece of the blueberry coffeecake you all published recently, I'd really be drooling. As it is, this is inspiring me to go get another piece! 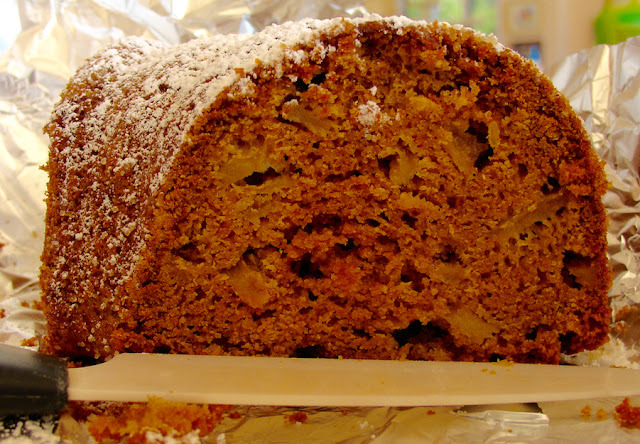 And in this round, Almond Cheesecake Bundt cake versus Apple Spice Bundt cake! ROFL! Ohh, that blueberry coffee cake was good, too! Yum! Looks great, I have some apples I need to use and this looks yummy! It's a perfect way to use up apples. I hope you like it as much as we do!